Robert Cravens never actually lived in SC according to Cravens researchers. However, he did visit and did acquire a tract of 150 acres "adjacent Robert Patterson". Apparently, it was Robert Patterson Jr that he was nearest. Cravens was also recorded as a Chain Bearer on nearby surveys, so he definitely visited SC. On the other hand, his brother William Cravens is known to have lived for about seven years in SC, so it is assumed that William Cravens lived on Robert Cravens' land. William was in turn a chain bearer on Robert Patterson Jr's survey, so it makes sense that these two tracts were next to each other. Also nearby was a sister of theirs, Magy (or Majey) Cravens Black, wife of Robert Black. These Cravens siblings were children of Robert Cravens Sr and Mary Harrison Cravens. James Patterson was a chain bearer for Robert Cravens' survey in 1767, and then seven years later it was sold to said James Patterson. However, it appears that James may have died about that time, and the land actually passed to James' father, Robert Patterson Sr. The latter also died in 1775. There is no further disposition of this tract of land on record until we get to 1802 when we see a Robert Wallace in possession of it, and he sold it to another Wallace. At that time, it was described as the former Robert Cravens' tract and adjacent Robert Patterson. At the same time, a 40 acre section of a neighboring tract of land was also sold by Wallace, and it described a stake in the corner of John Patterson's line. Later, in 1816, the legatees of Robert Wallace sold both the former Cravens tract and the neighboring 40 acres again, and it described the 40 acres as on the east side of the former Cravens tract. Given the 1802 and 1816 descriptions, it becomes easier to conclude that the Robert Cravens tract had somehow passed into the possession of John Patterson. We also see the 1791/92 survey and grant for Samuel Swan, and its two NE lines were adjacent John Patterson as well. So it seems that when Robert Patterson Sr died in 1775, the land remained unsettled until his widow Sarah died in 1790. John Patterson was born ca. 1762-65, so he wasn't old enough to possess land until the 1780's. Furthermore, John married his 1st cousin, Margaret Black - daughter of Joseph Black and Sarah Patterson - about 1786 or so, the same year John's father Thomas sold his land north of Robert Patterson Sr, to Robert Jr. 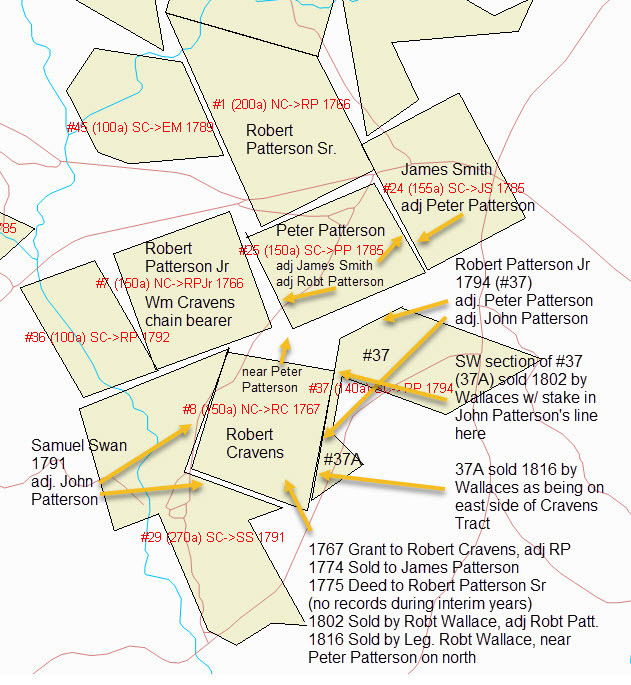 I am inclined to believe the family allowed John Patterson - and possibly Joseph Black's family too, whose land had been confiscated about 1783 or so - to live on the former Cravens tract. Keep in mind that William Cravens appears to have lived on the Cravens tract from about 1766 until 1773 or so. This would be a good time to also bring to light that William Cravens was married to Jane Harrison. And John Patterson's father, Thomas Patterson, was married to Margaret Harrison, presumed sister of Jane. If this is true, then William Cravens would have been an uncle to John Patterson. 1789 was when John's oldest son was born, named Joseph Black Patterson. Later, in 1813, Joseph Black Patterson named a son William Cravens Patterson. In fact, Joseph named his three oldest sons Joseph Black Patterson Jr, William Cravens Patterson, and John Thomas Patterson. Names do matter. So did John Patterson begin living here on the Cravens tract in the 1780's? And did it pass into his possession following his grandmother's death in 1790? Did John Patterson sell it to Robert Wallace around 1796-98, at which time John and his family moved to Buncombe Co NC? These are questions we many never fully answer, but we are certainly closer to understanding the timeline today than ever before.